Baby Bear’s very first swim. Today Boyfriend and I took Baby Bear for his very first swim and looking at him all dressed up in his tiny little swimsuit, he was even cuter than I ever could have imagined. 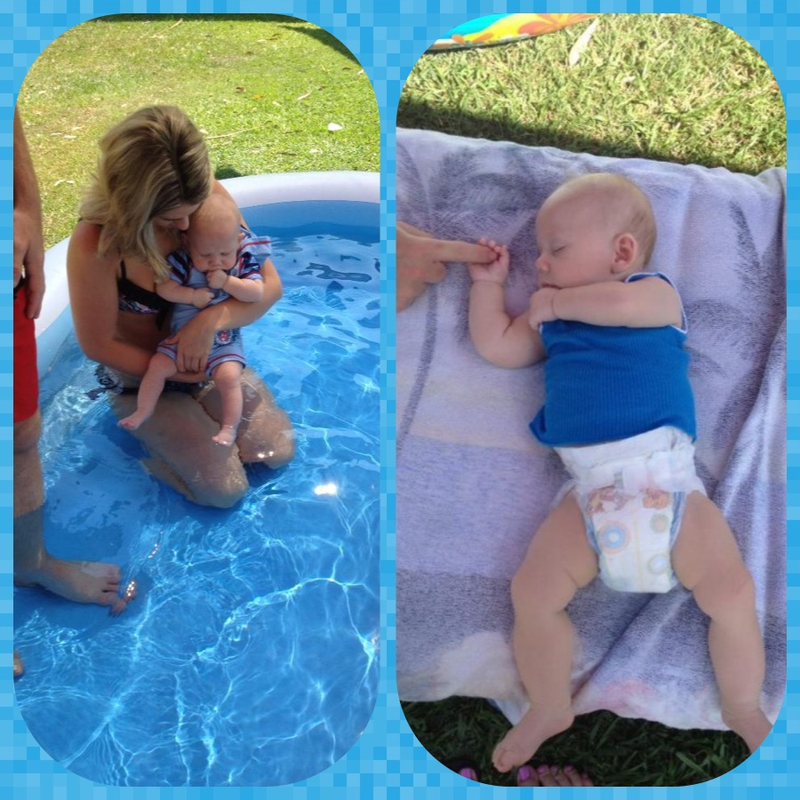 Between the two of us, we had spent most of the morning cleaning the house and setting up outside, so that my two bestfriends could come over and we could all wade around in our little blow up swimming pool, a swimming pool that to be quite honest, I don’t think Baby Bear really liked at all. Although the day was organised entirely around him, going by the expression on his adorably chubby face when I first put his tiny little feet in the water, Baby Bear did not at all like the idea of going for a swim. He didn’t scream and although he did his best not to cry, he did pull some fairly cute little cranky faces, while he was tucking his tiny little toes up as far away from the water as he possibly could. After taking his feet out of the water and giving him some time to warm up to the idea, eventually I tried again, this time doing my best to make the whole swimming idea seem a little more fun. Given the fact that he is only four months old though, he didn’t really seem to grasp the concept. In my opinion, I think he just saw the pool as one giant sized bath tub and considering he doesn’t really like his bath at the best of times, it shouldn’t really have come as a shock to find that he wasn’t thrilled at the idea. It wasn’t a complete failure though, at least the tiny little dip of his toes was still enough to wear him out. For the rest of the afternoon, while my three bestfriends and I were outside wading in the pool, our little Baby Bear was laying out on my sunbed underneath the shade cloth, snoring his beautiful little head off. Next time though, I think we might be better off to wait until our beautiful Baby Bear is a little bit bigger, a little bit stronger and perhaps a little bit braver. After all, you can’t really go swimming without getting your feet wet.